Inspired by the classic Easter bake, these Shortbread Hot Cross Buns are a twist and shortcut on the original. 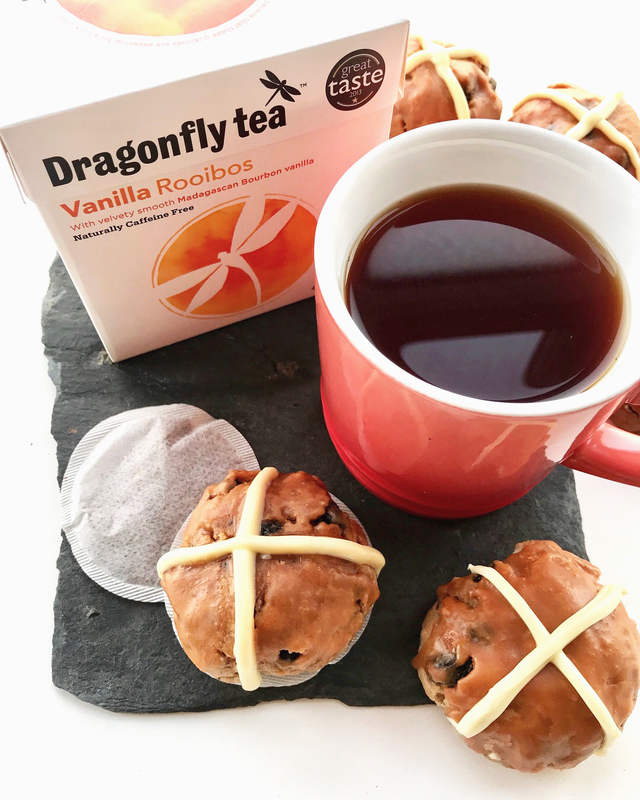 Alongside the ingredients found within a normal hot cross bun like mixed fruit and spice. These shortbread buns are also flavoured with the delicious warming aromas of Dragonfly tea vanilla rooibos, both in the dough and shortbread syrup glaze. 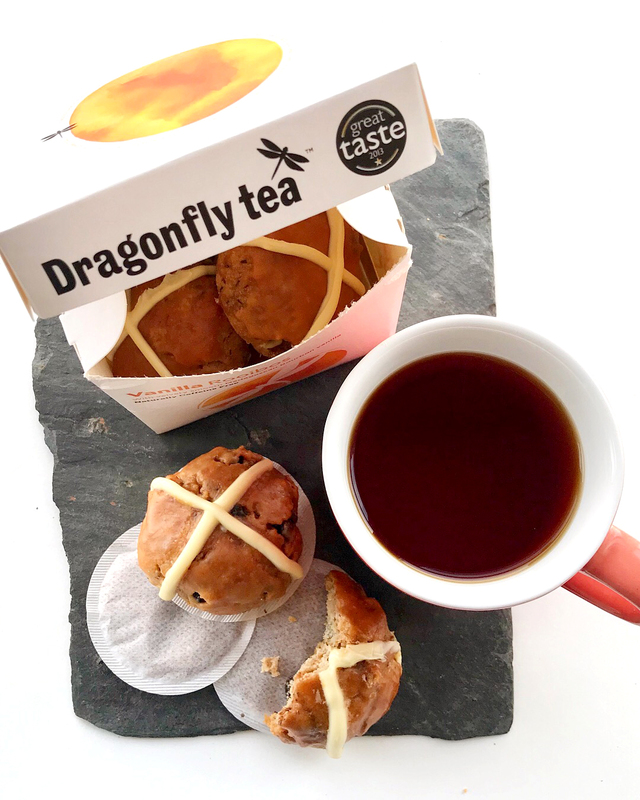 In fact these shortbread hot cross buns are the perfect partner to a mug of the tea itself. Whats more the finished batch of buns also fit perfectly inside an empty Dragonfly tea vanilla rooibos box. A box of tea and biscuits in more ways than one shortbread hot cross bun! Using a hand-held electric whisk, beat the butter, sugar and vanilla extract together for a couple of minutes or until smooth and creamy. Stir through the mixed fruit before adding in the mixed spice, flour and the contents of one of the tea bags. Use a spoon and then finally your hands to bring the mix together into a dough, but try not to overwork it– just like pastry, too much mixing or kneading will mean the baked shortbread won’t be ‘short’ and crumbly. Divide and shape the mixture into 6 ‘hot cross bun’ shaped balls and place on to a flat baking tray lined with non stick parchment paper. Chill for 15 minutes, or longer – this will help the shortbread to keep its shape during baking. While chilling preheat the oven to 170°C/150°C fan/gas 3. When ready bake the shortbread for approx 25 minutes until lightly golden brown. Leave to cool slightly on the tin while you prepare the rooibos syrup to glaze the shortbread buns with. Boil the kettle and add a tea bag to a small saucepan, when boiled add 100ml of the water to the pan and leave to steep for a few minutes. Make yourself a cup of tea at the same time! Remove the teabag from the pan, squeezing out the excess water from the bag. Add in the sugar and place the pan on a medium/high heat and bring to the boil. Turn the heat to low and stir constantly until the sugar dissolves completely and the mixture is a rich golden amber colour, approximately 5 minutes. Using a pastry brush, brush the syrup over the shortbread buns on the lined baking tray. Any excess syrup will be left on the paper, saving on the washing up later! Re-apply another layer of syrup if you have some left in the pan. While the syrup and shortbread is cooling prepare the white chocolate to create the hot cross bun crosses with. Boil the kettle; while waiting, put the white chocolate pieces into a small disposable piping bag and twist the end closed. Once the water has boiled, pour it into a tall glass or jug and submerge the piping bag into it. Leave the chocolate to melt inside the bag, then remove the bag and wipe dry with a tea towel. Wait for the chocolate to firm up a little: you don’t want to pipe it onto the shortbread buns while it’s still really runny. Once the chocolate has reached a paste-like consistency and the buns and glaze have cooled, snip a 1cm tip off the piping bag and pipe crosses over the shortbread buns while still on the tray. Allow everything to cool and set before carefully removing the shortbread hot cross buns from the paper, neatening off any excess set chocolate or syrup. Enjoy with a good cup of Dragonfly tea vanilla rooibos!